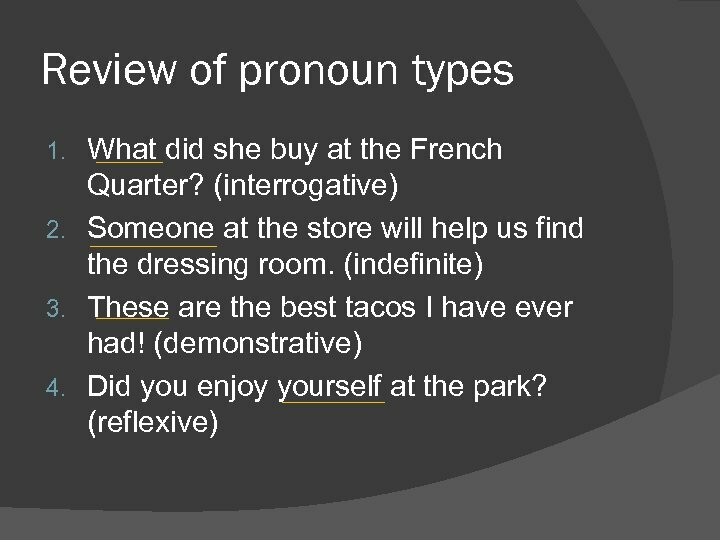 Review of pronoun types What did she buy at the French Quarter? (interrogative) 2. Someone at the store will help us find the dressing room. 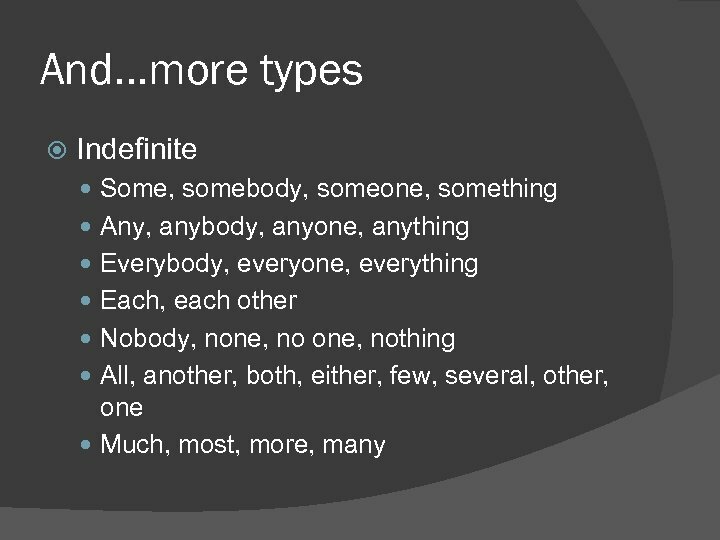 (indefinite) 3. These are the best tacos I have ever had! 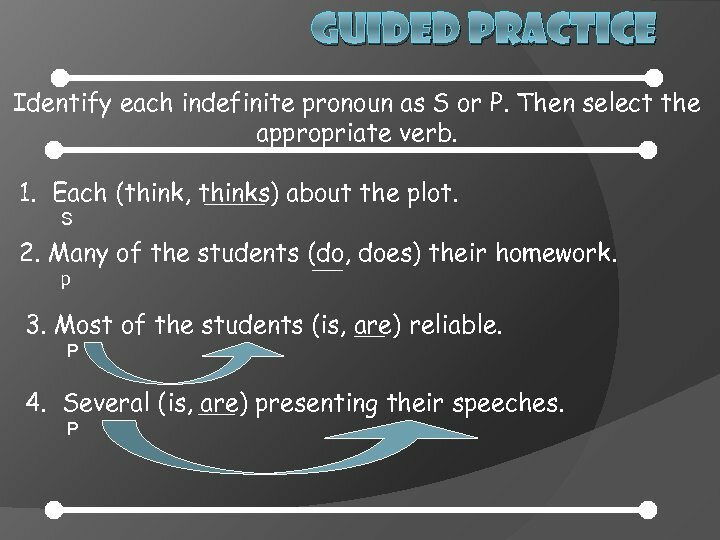 (demonstrative) 4. Did you enjoy yourself at the park? (reflexive) 1. 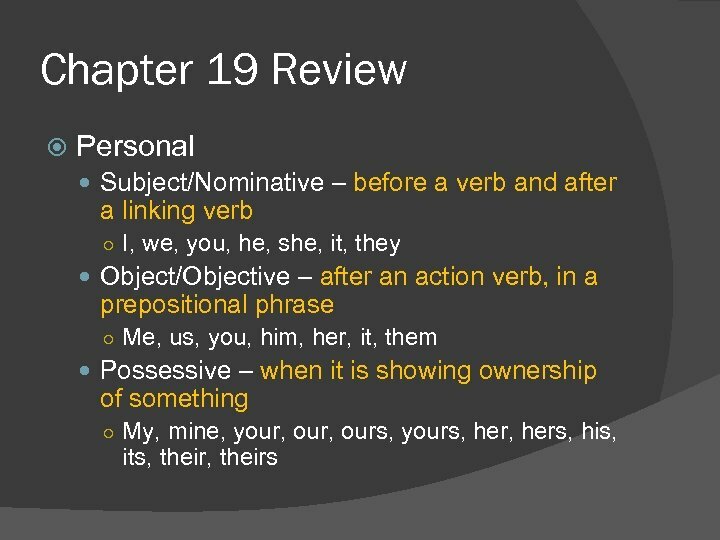 Watch out for the Indefinite Pronouns…. . Use a singular pronoun to refer to a singular indefinite pronoun ○ Singular indefinite pronouns - Anybody, anyone, anything, each, either, everybody, everyone, everything, neither, nobody, no one, nothing, one, somebody, someone, something Each of the snakes escaped from its cage. 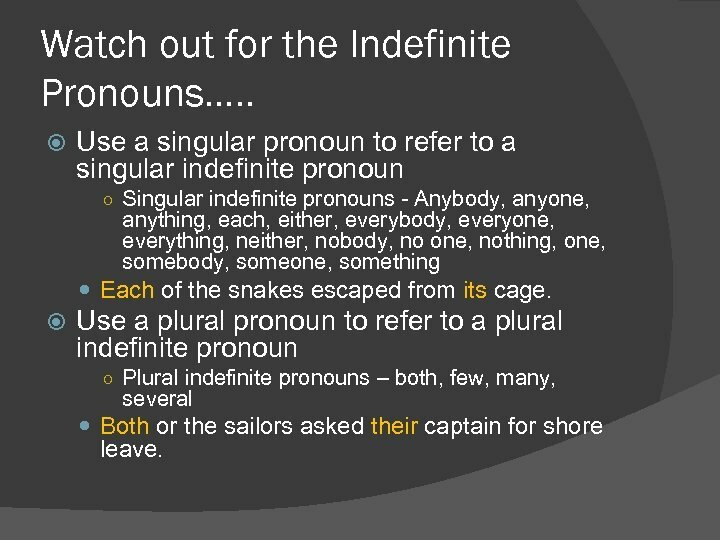 Use a plural pronoun to refer to a plural indefinite pronoun ○ Plural indefinite pronouns – both, few, many, several Both or the sailors asked their captain for shore leave. 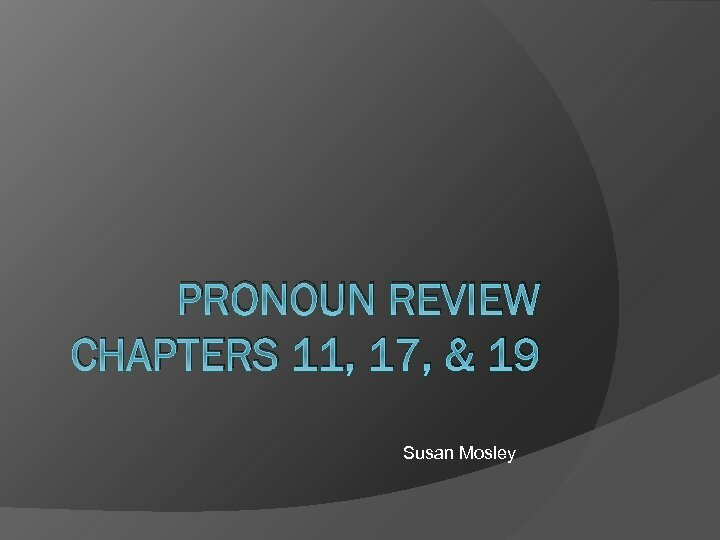 When dealing with an indefinite pronoun that could be singular or plural check the sentence to see which it is before selecting the pronoun that will refer back to it ○ Indefinite pronouns that can be singular or plural – all, any, more, most, none, some All of the book is interesting, isn’t it? All of the books are interesting, aren’t they? 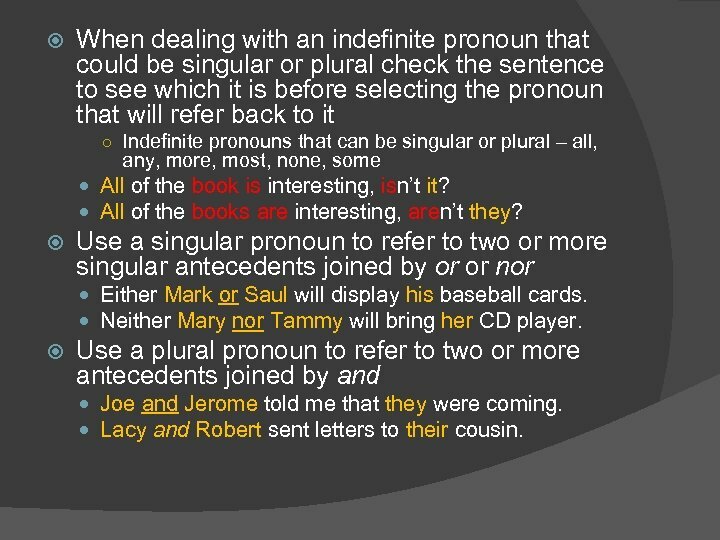 Use a singular pronoun to refer to two or more singular antecedents joined by or or nor Either Mark or Saul will display his baseball cards. Neither Mary nor Tammy will bring her CD player. 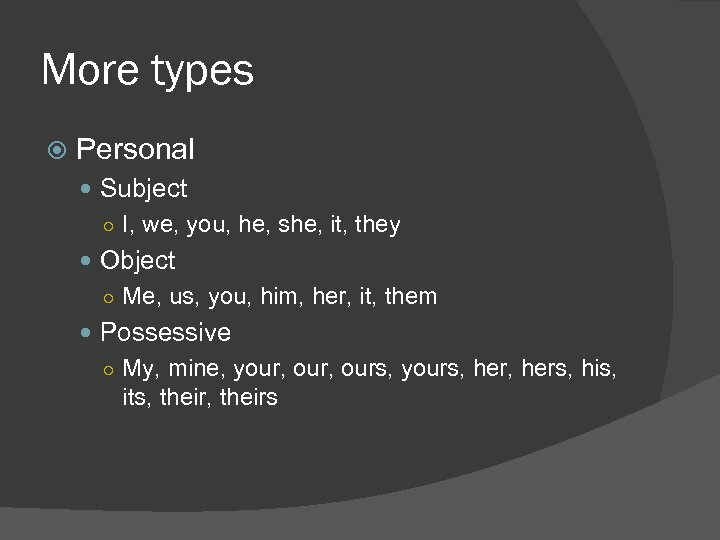 Use a plural pronoun to refer to two or more antecedents joined by and Joe and Jerome told me that they were coming. Lacy and Robert sent letters to their cousin. 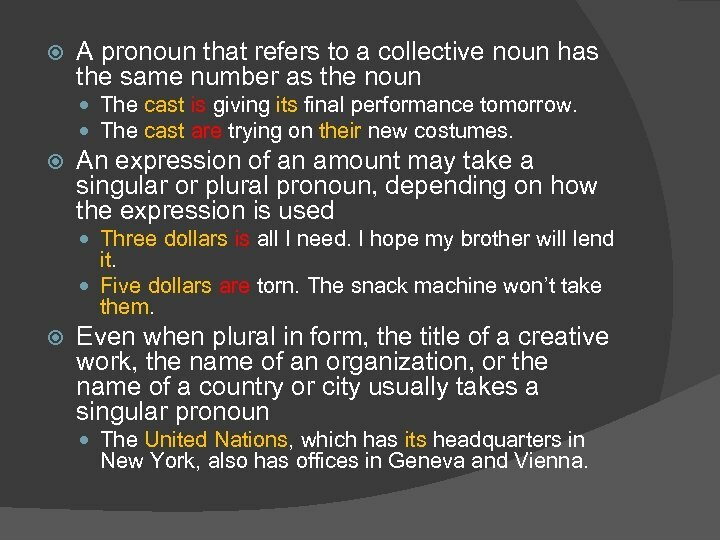 A pronoun that refers to a collective noun has the same number as the noun The cast is giving its final performance tomorrow. The cast are trying on their new costumes. An expression of an amount may take a singular or plural pronoun, depending on how the expression is used Three dollars is all I need. I hope my brother will lend it. Five dollars are torn. The snack machine won’t take them. 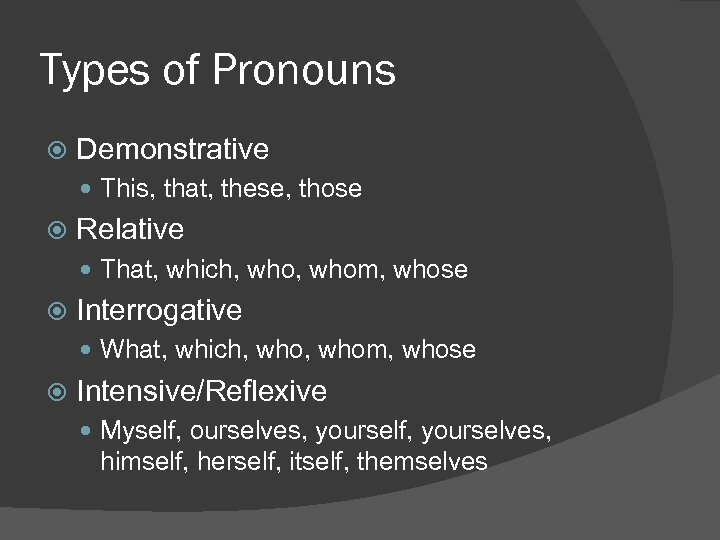 Even when plural in form, the title of a creative work, the name of an organization, or the name of a country or city usually takes a singular pronoun The United Nations, which has its headquarters in New York, also has offices in Geneva and Vienna. 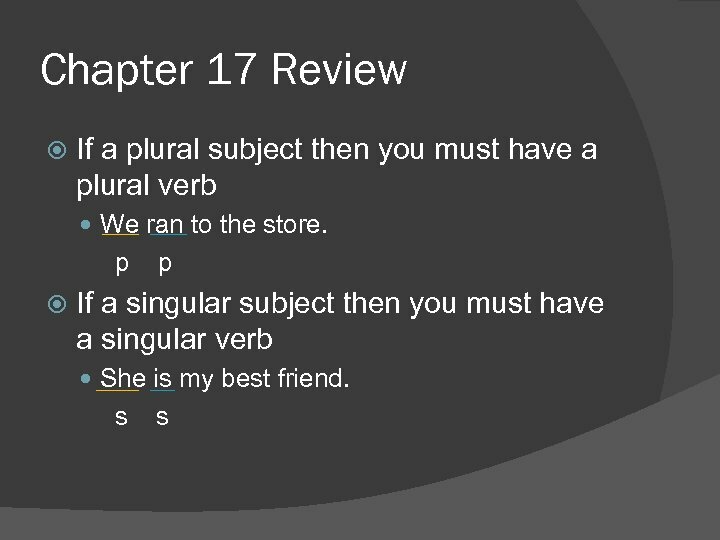 Review Practice 1. 2. 3. 4. 5. (Was, Were) the geese in the cornfield again? Neither Cindy nor her cousins (know, knows) how to sew. Giants of Jazz (is, are) an interesting book. 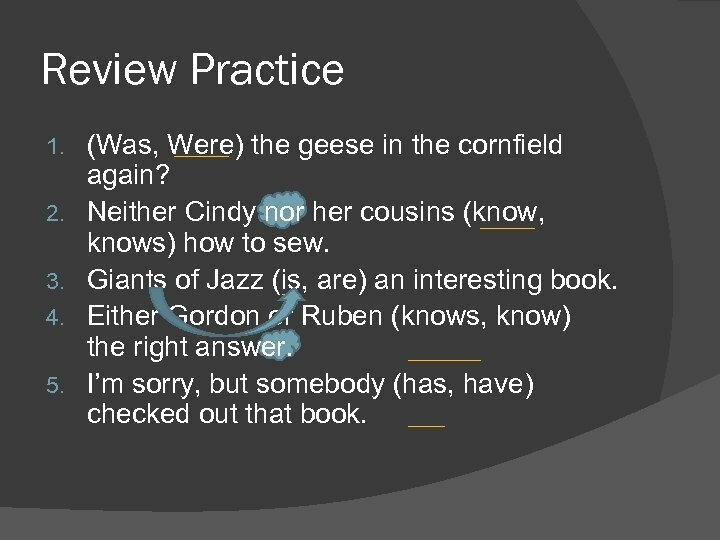 Either Gordon or Ruben (knows, know) the right answer. I’m sorry, but somebody (has, have) checked out that book. 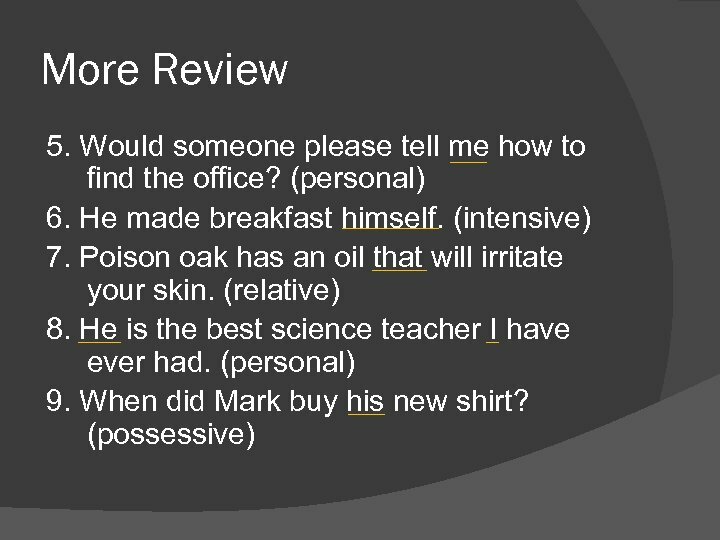 Review 1. 2. 3. 4. 5. 6. One hot afternoon Sara and (I, me) walked to the old creek. It’s a shame that the girls hurt (themselves, theirselves) last night. The fastest runners in class are Mike and (they, them). 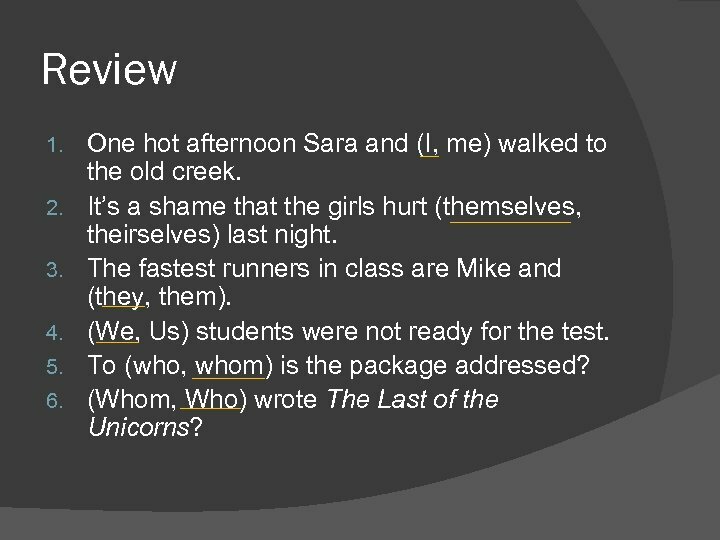 (We, Us) students were not ready for the test. To (who, whom) is the package addressed? (Whom, Who) wrote The Last of the Unicorns? OLD ENGLISH GRAMMAR. THE NOMINAL SYSTEM.